The Locked & Loaded Ladies members enjoy the camaraderie and fellowship resulting from our desire to learn and become more skilled and comfortable with our guns and shooting. We welcome any lady desiring to increase her knowledge and skills to join us on our journey. Thru class time, discussion, and range time, we will educate, equip, and empower the ladies in our community to become confident and competent LOCKED & LOADED LADY And, we will have fun while we do it! 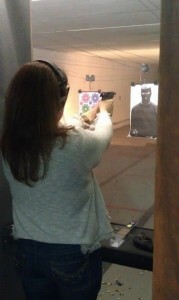 You know you are a LOCKED & LOADED LADY When…..
You have more guns than shoes. Your idea of feminine protection is not Tampax. You’d rather go to the range than to the mall. 22-9-45-38 are not your lottery numbers. When you have a holster to match each outfit. When you don’t have any more room in your gun safe. When you prevent yourself from being the victim! How would finish this statement? ?